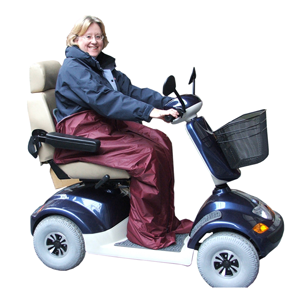 This cover has been specially designed with a waterproof outer and a luxurious fleece liner to offer the scooter user as much warmth and protection as possible. The open bottom style allows your feet to straddle the centre wheel arch or put your foot out when manoeuvring around corners. This cover has been specially designed with a waterproof outer and a luxurious fleece liner to offer the scooter user as much warmth and protection as possible. The open bottom style allows your feet to straddle the centre wheel arch or put your foot out when manoeuvring around corners. The Skoota Kozee Toze has two concealed security pockets. The full-length open-ended zip fastens from the top down allowing you to mount or dismount with maximum ease. The bottom of the cover has a wipe clean nylon skirt to protect your feet. This cover can be used with any scooter and if used with either the Skoota Kape or Skoota Mate, you will be in a warm dry cocoon. It is available in one size in a choice of Royal Blue, Grey or Maroon.